GAO report on the poor quality of the US climate monitoring network | Watts Up With That? …the report notes, “NOAA does not centrally track whether USHCN stations adhere to siting standards…nor does it have an agency-wide policy regarding stations that don’t meet standards.” The report continues, “Many of the USHCN stations have incomplete temperature records; very few have complete records. 24 of the 1,218 stations (about 2 percent) have complete data from the time they were established.” GAO goes on to state that most stations with long temperature records are likely to have undergone multiple changes in measurement conditions. The report shows by their methodology that 42% of the network in 2010 failed to meet siting standards and they have recommendations to NOAA for solving this problem. This number is of course much lower than what we have found in the surfacestations.org survey, but bear in mind that NOAA has been slowly and systematically following my lead and reports and closing the worst stations or removing them from USHCN duty. For example I pointed out that the famous Marysville station (see An old friend put out to pasture: Marysville is no longer a USHCN climate station of record) that started all this was closed just a few months after I reported issues with its atrocious siting. Recent discoveries of closures include Armore (shown below) and Durant OK. This may account for a portion the lower 42% figure for “active stations” the GAO found. Another reason might be that they tended towards using a less exacting rating system than we did. While NCDC has gone to great lengths to defend the quality of the USHCN network, their actions of closing them speak far louder than written words and peer reviewed publications. The National Oceanic and Atmospheric Administration (NOAA) maintains a network of weather-monitoring stations known as the U.S. Historical Climatology Network (USHCN), which monitors the nation’s climate and analyzes long-term surface temperature trends. Recent reports have shown that some stations in the USHCN are not sited in accordance with NOAA’s standards, which state that temperature instruments should be located away from extensive paved surfaces or obstructions such as buildings and trees. GAO was asked to examine (1) how NOAA chose stations for the USHCN, (2) the extent to which these stations meet siting standards and other requirements, and (3) the extent to which NOAA tracks USHCN stations’ adherence to siting standards and other requirements and has established a policy for addressing nonadherence to siting standards. GAO reviewed data and documents, interviewed key NOAA officials, surveyed the 116 NOAA weather forecast offices responsible for managing stations in the USHCN, and visited 8 forecast offices. In choosing USHCN stations from a larger set of existing weather-monitoring stations, NOAA placed a high priority on achieving a relatively uniform geographic distribution of stations across the contiguous 48 states. NOAA balanced geographic distribution with other factors, including a desire for a long history of temperature records, limited periods of missing data, and stability of a station’s location and other measurement conditions, since changes in such conditions can cause temperature shifts unrelated to climate trends. NOAA had to make certain exceptions, such as including many stations that had incomplete temperature records. In general, the extent to which the stations met NOAA’s siting standards played a limited role in the designation process, in part because NOAA officials considered other factors, such as geographic distribution and a long history of records, to be more important. USHCN stations meet NOAA’s siting standards and management requirements to varying degrees. According to GAO’s survey of weather forecast offices, about 42 percent of the active stations in 2010 did not meet one or more of the siting standards. With regard to management requirements, GAO found that the weather forecast offices had generally but not always met the requirements to conduct annual station inspections and to update station records. NOAA officials told GAO that it is important to annually visit stations and keep records up to date, including siting conditions, so that NOAA and other users of the data know the conditions under which they were recorded. 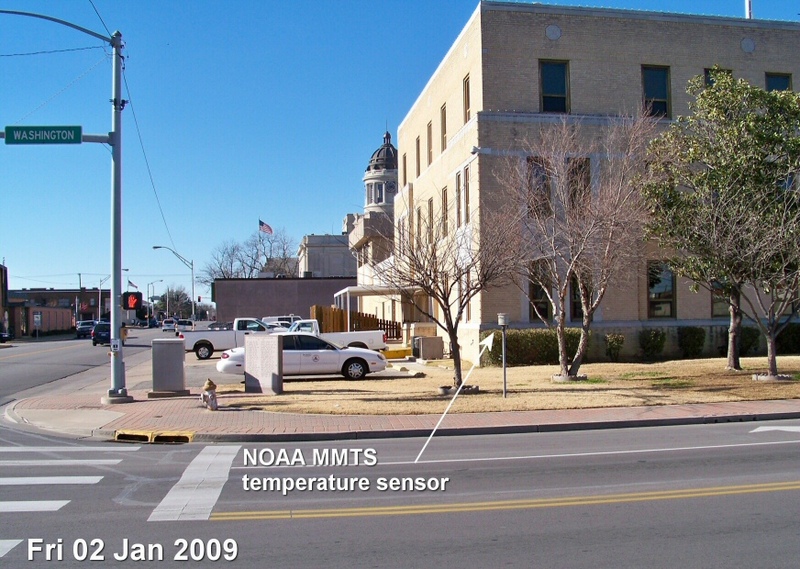 NOAA officials identified a variety of challenges that contribute to some stations not adhering to siting standards and management requirements, including the use of temperature-measuring equipment that is connected by a cable to an indoor readout device–which can require installing equipment closer to buildings than specified in the siting standards. NOAA does not centrally track whether USHCN stations adhere to siting standards and the requirement to update station records, and it does not have an agencywide policy regarding stations that do not meet its siting standards. Performance management guidelines call for using performance information to assess program results. NOAA’s information systems, however, are not designed to centrally track whether stations in the USHCN meet its siting standards or the requirement to update station records. Without centrally available information, NOAA cannot easily measure the performance of the USHCN in meeting siting standards and management requirements. Furthermore, federal internal control standards call for agencies to document their policies and procedures to help managers achieve desired results. NOAA has not developed an agencywide policy, however, that clarifies for agency staff whether stations that do not adhere to siting standards should remain open because the continuity of the data is important, or should be moved or closed. As a result, weather forecast offices do not have a basis for making consistent decisions to address stations that do not meet the siting standards. GAO recommends that NOAA enhance its information systems to centrally capture information useful in managing the USHCN and develop a policy on how to address stations that do not meet its siting standards. NOAA agreed with GAO’s recommendations. Our recommendations from this work are listed below with a Contact for more information. Status will change from “In process” to “Open,” “Closed – implemented,” or “Closed – not implemented” based on our follow up work. Recommendation: To improve the National Weather Service’s (NWS) ability to manage the USHCN in accordance with performance management guidelines and federal internal control standards, as well as to strengthen congressional and public confidence in the data the network provides, the Acting Secretary of Commerce should direct the Administrator of NOAA to enhance NWS’s information system to centrally capture information that would be useful in managing stations in the USHCN, including (1) more complete data on siting conditions (including when siting conditions change), which would allow the agency to assess the extent to which the stations meet its siting standards, and (2) existing data on when station records were last updated to monitor whether the records are being updated at least once every 5 years as NWS requires. Recommendation: To improve the National Weather Service’s (NWS) ability to manage the USHCN in accordance with performance management guidelines and federal internal control standards, as well as to strengthen congressional and public confidence in the data the network provides, the Acting Secretary of Commerce should direct the Administrator of NOAA to develop an NWS agencywide policy, in consultation with the National Climatic Data Center, on the actions weather forecast offices should take to address stations that do not meet siting standards. So it isn’t Climate Disruption we’re facing–it’s Climate Monitoring station Disruption that’s causing the problem. I really think containing CO2 will have no impact at all–they just simply need to adhere to their own siting standards. The CAGW crowd is gonna be disappointed! What, no activist crowd to camp out and protect the faulty station siting? I guess they did not get the call to action memo in time. Or they were at the Wall Street event instead. Honestly, I think Tom Karl has been less than competent in his job. One would have thought, given the claimed extreme importance of the surface temperature record, that his highest priority would have been to evaluate the accuracy of the record by distributing calibration experiments at selected climate stations all around the US, and by validating or up-grading the quality of all the USHCN stations. And this should have begun 20 years ago, when all the AGW dust was originally raised. But he did none of that. Instead he was just was buddy-buddy with all the AGW folks and published papers that forwarded the status quo. The cynic in me predicts that they will be found to have removed, closed or (possibly) upgraded station without keeping records of which stations were egregiously in error. This will make it impossible to know which stations have data so bad that they should be thrown out. Was any of this information incorporated into the Berkeley Earth Surface Temperature analysis? It was mentioned at Climate etc. that a few papers were about to be submitted. From the AGU Fall Meeting Abstracts, it would appear that the sensitivity of the overall signal to these issues really isn’t that big. The details should be interesting! “We calculate the effect of poor station quality, as documented in the US by the team led by Anthony Watts by estimating the temperature trends based solely on the stations ranked good (1,2 or 1,2,3 in the NOAA ranking scheme). We avoid issues of homogenization bias by using raw data; at times when the records are discontinuous (e.g. due to station moves) we break the record into smaller segments and analyze those, rather than attempt to correct the discontinuity. You guys are like fish out of water, thrashing around while rapidly asphyxiating. Once-upon-a-time, people like Ian Strangeways might have had a legit[i]mate point to make about the heat island effect (which may well be why this particular station has been re-sited). However, if you think that this – or our supposed inability to measure average su[r]face temperatures because we are land based creatures, or whatever is the plat du jour – casts doubt on the reality of AGW, then you are badly mistaken. All research methods are not equally good; and all opinions are not equally valid. In life, there are winners and losers; there are right and wrong answers; bad decisions have consequences; and poor judgement could be very expensive in the long run. You will no doubt say, rightly, that in science nothing is ever certain but, in seeking to perpetuate a debate that should have been over 150 years ago, you are just making this problem much much harder for us to ultimately solve. It would be a start, but nowhere near enough, if you could at least admit that we are causing the problem – as Tim Worstall has done very clearly on my blog today. I love this site, so don’t misinterpret my skepticism or anything, but… taking a page from your video analysis, here. Why are there buds on the tree in January, but none in March??? Once again, testimony to the power of individual initiative and the internet. A government bureaucracy changed its procedures because someone cared enough to look and hold the institution to account. Did members of Al Gore’s science experiment production team take thes two pictures at Ardmore ? The date stamp says that they are taken more than two years apart, however. 1) The same white car is in the same parking space in both pictures. 2) The Church in the background has moved many feet to the left in the lower photo. 3) The pedestrian crossing on the left side of the upper picture has disappeared in the lower one. At some point they’re going to have to admit that there is no reliable US temperature record. That’s a great photo of the Ardmore station. I wonder how many people have parked on that street and tried to put a quarter in it? I think I understand the problem now. You have this station site, as the community around it grows, the ambient temperature increases. Eventually they re-site the station. Because they move the site to a place with lower population density, the ambient temperature drops. They add an ‘adjustment’ to make the site’s measured temps roughly equal to the old site. The population continues to expand, creating more local warming. Repeat ad infinitum. How do you measure anything other than perpetually warmer temps with this system? This is worse than if you left the site in it’s original place, UHI tops out at a certain point. If you just keep moving the site to the outskirts of town and adding adjustments, the AGW gravy train never has to end. Too bad (for the Climate Gravy Train Scientists) satellite data will eventually curtail the need to depend on these stations. Anthony, thanks for getting this posted so quickly, seeing as Inhofe’s staff released this item just this afternoon. My concern is that the USHCN is now less well populated with any kind of stations, and as it now exists, leaves many more gaps in coverage. As well, the other concern would be if they have removed the monitors, but left the data, or terminated current use of the stations, but again have left old data in such a manner that it effectively contaminates the trend analyses, etc. Gaps in data (of varying quality) and poor data left in the system are not likely to be of any help to anyone. Assuming that you will publish my comment (including URLs) submitted 25 minutes ago, please note that para. 1, sentence 2 should read… “However, if you think that this – or our supposed inability to measure average suface temperatures because we are land based creatures, or whatever is the plat du jour – casts doubt on the reality of AGW, then you are badly mistaken.” …If you should chose to edit it and then delete this, even better. The bad news: Half our data is buffalo chips. The good news: There’s plenty of ’em. Congratulations Anthony and the surface station crew. Looks like you have had a major impact. I very much doubt that you would be writing about this report or that Senator Inhofe would know about the problem with out you and the crew. The trouble is all the rubbish data poor station provided will clog in the systems for years to come , and we will still have policy and research based on it unless there is some serious data cleansing , and can anyone see that happening ? Bottom line this station was never designed to be used in the way it has become, particularly airport based stations as they where intended to provided the aircraft coming in and out with very local weather data not to have their results smeared across many miles. It’s not just the station siting that is a concern. How reliable are the data records? Is there any QC (e.g., having a second person check any data that are entered manually)? Is there careful annotation when stations are moved? Are any “adjustments” in station data carefully explained and the algorithm used for the adjustments shown and justified? This is correct. Unfortunately, jumping to judgement also has consequences, both monetary and in real terms. There are finite resources, so taking action on something today for which “proof” today is limited to theories and hypotheses, and where observations do not fully support said theories and hypotheses will impose costs (real and monetary) on the community. Once those costs are imposed, and resources expended, they are not there for anything else. As well, science advances best from such discoveries as Tyndall’s of 150 years ago (relatively “abstract” laboratory experimental results at the time; as opposed to real-world implications as you imply) by informed discourse within the broad scientific community, well-designed and executed studies, cooperative research endeavors and the like. We (society) are not yet there in many areas, and harsh words by politicians and advocates seeking to still discourse — including that from those who are not yet convinced of a solid scientific foundation for the issue du jour — does not help advance science. Instead, it may be merely delay tactics in the advocates’ hopes for “action now” even though science may one day prove the action was a waste of resources or, worse, so fundamentally flawed that those “actions to save ____” were actually more problematic than the original concern. In the end, such “action now” campaigns may be bad decisions; making such decisions in a void or without all viewpoints considered risks imposing significant costs on our descendants too. You lack blog traffic, so you advertise here for free. How about making a donation? If you had read the article you would see that it supports Anthony’s Surface Stations paper. Sorry you’re unhappy about that, but the fact is the USHCN stations are in a shambles. The data is completely untrustworthy when comparing a 0.7° temperature rise over 160 years, when the USHCN station errors are 5°C – or more. See here. Pure psychological projection and self-important puffery. You’re not solving anything, because the “problem” exists only in your head. The climate alarmist contingent completely ignores the scientific method, rejects transparency, hides out from real debates, and continues to sound a false alarm. The alarmist crowd cannot admit that nothing unusual is happening; they have no understanding of the null hypothesis. There is zero evidence of any global damage from the rise in CO2, and their convoluted, contorted arguments trying to explain away the failure of the planet to heat up over the past fourteen years, as endlessly predicted by jokers like James Hansen, are getting plainly ridiculous. CO2 [“carbon” to the scientifically illiterate] is a harmless and beneficial trace gas at current and projected concentrations. More is demonstrably better for the biosphere. Falsify that hypothesis, if you can. Show us all that global damage CO2 is causing. Yes I am sure they use the Drug Co.s methods. Hire someone to make up the stuff out of whole cloth. “….The Food and Drug Administration (FDA) is warning pharmaceutical companies that they may have to take a second look at any drugs tested by Cetero Research, since it was recently discovered that the research firm was faking test results. You will no doubt say, rightly, that in science nothing is ever certain but, in seeking to perpetuate a debate that should have been over 150 years ago, you are just making this problem much much harder for us to ultimately solve. So you’re saying your great-great-great grandparents didn’t want the earth to warm 1 degree over all those bygone years? Are you saying the crop failures they endured were wonderful to endure? Are you really serious? I think not; epic fail on so many aspects, Martin. Call us fish out of water if you have to, but you are clueless about what man could do to “solve” this natural phenomenon that is creating a far more beneficial world–to both plants and animals, and that includes humans, too! I’m saddened you’re so gullible. I’m surprised you’ve just taken the CAGW’s talking points at face value. We are already taking action – we’re burning fossil fuels and dumping enormous amounts of C02 into the atmosphere. This is not a situation we’re currently doing nothing and advocates of two different courses of action (“burn fossil fuels”, “use non-fossil fuels”) are trying to convince society to act according to their preferences. We’re already performing one of those actions and the best scientific evidence available strongly suggests that action will produce consequences most consider undesirable. It’s necessary to consider the impact of new information in relation to existing conclusions. We already know the warming that’s been detected is not an artefact of the monitoring network. We have the analysis published by both Menne and Mr Watts which show that warming trends are not caused by site quality. We know that the trends produced by ground station network are similar to the satellite one. Consequently if someone suggests that a report like this has any impact on the decision as to whether we should change how we act in relation to fossil fuels then that person is grossly misrepresenting its importance. Better data is always good, a better monitoring network is always good (although I don’t recall the reaction here being favourable when NOAA requested more funds for precisely that) however it should not be permissible that people be able to use unrealistic requests for perfect data as a shield to prevent action. If you ever bothered to look at what is DONE and not what they SAY you would see that this has been a money making scam from the start. The Danish text, a secret draft agreement at Copenhagen, giving effective control of climate change finance to the World Bank should have been a really big clue. So I take it from your statement you are in favor of the actions of the World Bank, Al Gore and Maurice Strong??? Smokey. CRN5 does not mean that the station errors are 5C. This been explained over 4 years ago by the researcher who developed the scale. If CRN5 were consistently and reliably 5C warmer or cooler than the CRN1, then Anthony’s study would have found a large difference between the two types of sites. It did not. He found no difference in mean. Errors in Tmax were offset by errors in Tmin. CRN5 actually refers to variance, not bias. This was established by experiement. …1) The same white car is in the same parking space in both pictures. (1) Yes. (2) Not correct. (3) Not correct. Look very closely. Take this exercise as a parable of the improvement in observational skills that Climate Science needs. Or perhaps you did look closely, and are testing us?? We’re talking about temperature station data and the relevance of this report. Al Gore and other pet topics are not relevant. Is it troll feeding time? 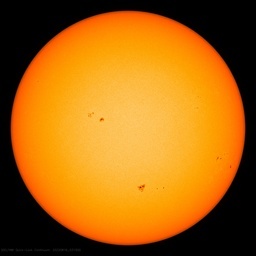 It certainlly casts doubt on whether we are obtaining accurate data on the surface stations. If you don’t know what change is happening in the temperature, how can you assess whether anything is happening? Moreover, while this doesn’t change whether some form of AGW may be happening, the poor siting and lack of accurate data does not support the possibility that the AGW will be catastrophic. or to add more properly sited stations to fill in coverage in particular areas. data from the same station. models using that data. It would amount to organizational suicide. naming villians and bootstrapping more funding cuts all over the place. to accrue more well placed weather reporting stations. Different years ? could that be it ? Immediate thought: this guy is new, has really not looked closely at WUWT and doesn’t have a clue. Martin, this whole blog soared to its current fame because professional meteorologist Roger Pielke alerted professional meteorologist Anthony Watts to issues with the surface stations, and when Anthony went to look, he was so horrified with the breaches of standards he found, that he determined to start a huge project, to check every single USHCN station. And did. With outstandingly professional help from unpaid volunteers. And wrote a firstclass paper that was duly published and peer-reviewed. We’ve all been following this epic narrative, because it touches important issues of integrity that official Science has currently lost. Martin, you couldn’t have been more mistaken. Take care when accusing, for almost always the accusing finger points backwards to oneself. If you are really interested in the truth, read more carefully before posting next time. If you need a primer on Climate Science, click my name. Most of us were once warmists who did U-turns when we examined the evidence more carefully. Compare and contrast the comments there concerning spending money to improve the network versus thus here and elsewhere about how the network just isn’t good enough and we’d best ignore it all until it gets better. That variance would have to be invariably Gaussian — or at least invariably symmetrical about zero — to transmit no uncertainty into the record. I’d be interested to read the experimental work, Steve. Can you post a citation? Thanks. These are the same people whose claim to be able to count fish populations in the seas of the world – computer modeling, anyone? – is routinely taken at face value to justify the reorganization of one of man’s oldest and proudest industries, fishing, and the allocation of fishing rights to friends. Is there no reason to be skeptical? I followed the link you provided to your blog. In order to save others time, I’d summarize it as conspiracist nonsense. Then go into Street view, Look about N 15 W.
Look for it in the SHADE under the southern most, closest TREE. I don’t know how to get the meta data for the street view, but shadows Appear to be summer time, afternoon. The same white car is there. It’s the police station. Are they replacing these closed stations with new stations, properly sited, or are there now less and less stations around? How many stations are too few to accuratly report national and especially global weather? I suggest that, being government bureaucrats, they are most interested in other things, like their own pensions, saleries, pensions, benefits, pensions, opulent offices buildings and grounds (with ugly but expensive statues), and did I mention pensions? Those are the things they want to reserve the money for. Plus, actually going out into the field and properly siting a station is, you know, work. Work is for peons, they have all got seniority now, that sort of thing is benieth them, who wants to leave your comfortable office, the seat of your bureaucratic power? Too many chiefs, not enough indians. I mean, look at the cover of yesterdays USA Today, what does it say, how about that little peice about how federal salaries, pensions, and benefits are, to use their words, exploding? More and more of your tax dollars simply goes to pay (one way or another) a hord of bureaucrats, even the mainstream press is catching on. There simply is not enough money left over to, you know, actually DO anything. When they finally get around to closing the last station, why, then, they will get to keep ALL the money for themselves. besides, who needs that stuff, they have computer models. Walk about 20 feet north of the crosswalk on Washington. Turn West. The Temperature station is clearly visible, with the white car and parking lot behind it. There is a “2009 Google” watermark visible around the “Washington” Street sign over the intersection. This is a re-posting of my comment at a somewhat OT (Greenland) thread. Anthony’s graph (1) exhibits a +4 degC rise over a 50-year period, while the “new” graph (2) shows only a +2 degC rise over the same period; and the direction of “adjustment”, if any, appears to be “past years drastically upward”, as opposed to their “tradition”. Excellent link to part of the backstory on the GAO’s report. funding for a specific program allocation. flow, or trim storage or transportation costs. request funding for a continuing upgrade of USHCN stations. Such suspicions would probably be justified. Previously Hansen et al said that regardless of the siting issues, the anomaly values were good as UHIE was taken into account. The Urban vs Rural cross-check seemed to bear this out, unless the rural corrections were based on the urban records, of course (they were, weren’t they?). Dropping a lot of stations didn’t seem to change the trends and amounts that Hansen claimed was happening. Will the admission that many required replacement change the outcome significantly? If NOAA says all their corrections fixed the siting problems, than this means nothing in getting Hansen’s temperature records reduced as per HadCruT. As an Oklahoman, I thought I would try to address the question about the presence/absence of tree buds in the two photos. 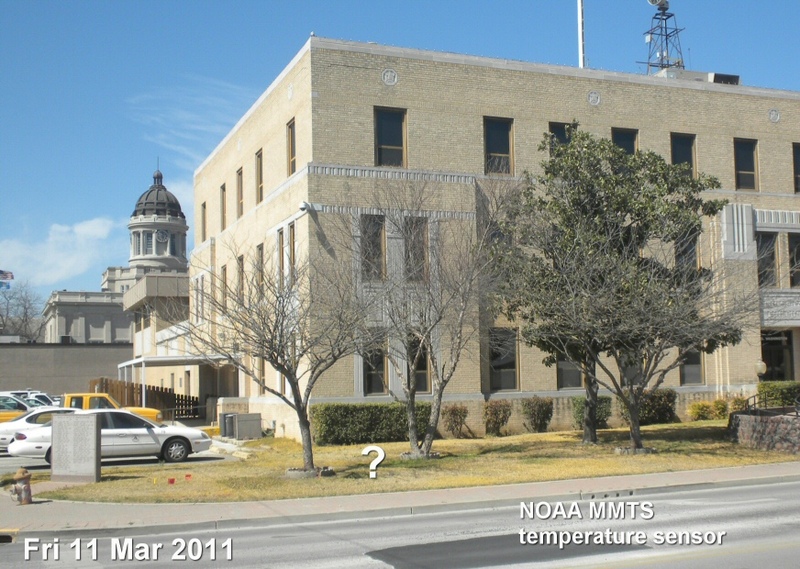 According to NOAA, from looking at the daily records for Lawton (about 100 miles west of Ardmore, but about as close as you can get with the records on the web site), there was more unseasonably cold weather in the month before the March 2011 photo than in the month before the January 2009 photo. It was very dry both years during these times I’m talking about, but I’ve seen the trees respond more to temperature increases (even temporary ones) than wet/dry conditions. The weather varies a lot here. Some winters we get next-to-no snow/ice. Other years, we have a blizzard or two. Most of the snow is here today, gone tomorrow. Most townspeople don’t have snow tires. I do remember a time when we didn’t have snowplows, but nowadays the towns often rig up a plow on the front of a heavy truck and make that work. We don’t use as much salt as states farther north, but we can use lots of sand some years. The key question is, at which stations can we be reasonably confident any climate signal exceeds all other signals So that any trend can reasonably be assumed to be a climate trend. IMO hardly any surface stations would meet this criteria. It seems every few days something comes to light that is likely to affect surface station temperature measurement. This week it was more CO2 causing taller trees, hence less near ground wind and air turbulence. Which would retain heat near the ground. Thus biasing temperatures upward at the measured height. I’ve argued in the past that the whole approach is wrong and we should be looking for stations in the most pristine locations we can find and just using them. Lighthouses and remote islands are likely candidates. 50 to 100 locations would be sufficient to show whatever global climate trend exists. The important question is how these quality issues contribute to the uncertainty in the broader signal. The anecdotal discussions of selected stations are good motivation to do that, but don’t mean much individually. The BEST project is addressing this issue to an extensive degree. be evaluated? How much difference between an all-station signal and a high-quality-station-only signal would be considered “big”? Or between BEST, Hadley, GISS and NCDC? Now would be the time to do that, so as to remain objective when it comes out. There were two concerns with siting. that I have done. from the early days on CA where we only had 300 stations. What we could see was a bias of about .1 to .2 C. That work lay dormant until all the station data was released. the temperature. So, they basically saw in their limited test an increase in variance. came into being. A very simple field experiment. 2. My concern over increased variance and consequently decreased confidence in the numbers. With all the stations completed it should be possible to test. When I talked with Muller about this he seemed to express some interest in the test. Dont know if he completed it. Personally, I’m working on other things and am not pre disposed to play fetch it unless somebody has a real hypothesis to test and is willing to change their views as a result of the test. Now that I have hourly data from CRN ( with three redundant sensors ) I have a pretty good idea of what to look for in the USHCN data when I get around to that.. and with daily wind and cloud and precip data for the stations, all lot more will be evident. Again, what I am trying to clarify for people is how the CRN1-5 numbering system came into being. That is a history question not a science question. The history is that the team set up a field experiment. Very limited. They constructed 4 types of stations with different siting issues ( they never made a CRN5 ) they then measured the temps at these prototypical stations. They found that as you worsened the siting, the spread of data increased. That’s just what they found and how they assigned numbers to the codes. If you search the relevant threads at CA and Lucia’s you will find the scientist. And if you speak French you’ll have an easier time. But dont expect very much in the way of documentation or data. Again, its just history on how the numbering system got established. So, I am not surprised to find no bias in Tave. in fact, it’s what we would expect given the small bias we found with 300 or so stations. If the bias was huge and pervasive you’d see it easily. you’d see a huge disconnect between the land record and the UHA record, you’d see it in the Modis LST product. Well then, we should just accept your word. That’s how all the alarmist arguments end up. There is no scientific evidence. There are only computer models, and they have failed to predict climate behavior even over the last 10 years. Many, many assumptions have to be put into the models, and unknown coefficients have to be tuned. Even the amount of temperature increase that we have supposedly measured over the last 100 years is small enough to be well within the error of the instruments. If there is evidence, or data, please direct us to it. Saying things like the spring thaws seem to happen earlier, or there seems to be more storms, or mosquitos are found farther north is not very strong due to many factors besides warming and often times the measurements of these things are not very rigorous. Now of course there is general agreement that in isolation, doubling CO2 concentration should increase temperature approx. 1C, but the climate is not in isolation. Other complex and poorly understood processes unfold, and the result is clearly not predictable at this time. So, what happens as they remove the stations from rooftops, next to AC units and BBQ grills, and in parking lots while keeping the well-sited stations? I would think that there could be a downward temperature shift, but I know there are complex homogenization routines that may do something unpredictable (to me anyway). I would also imagine that new homogenization/normalization routines would be created to avoid the look of a temperature decrease. Does anyone have any thoughts on this? The poor quality means how many decimals degrees or even more than a degree of temperature wrongly measured? God Bless the volunteers of USHCN –it isn’t their fault. I met a few –they care and made sacrificises in the context over long periods of time in the context of what they were asked to do by those responsible for asking them. Nothing but love for those folks. It is a planetary disgrace that the richest nation on the globe had to rely on a voluntary effort (surfacestations.org) to uncover the limitations of the official effort, and that was resisted at every step by the status quo to bring those issues to light. I’m proud to have contributed. I’m ashamed of my country that it was necessary for such an effort to be lead privately. I’ve said it before, I’ll say it again –Anthony, we done good no matter the impact, and shame on the status quo for leaving it to us to do without their leadership and organizational resources. Reducing uncertainty is damn straight worthwhile when the stakes are those we’re dealing with here. Hey, I’m a “peer network” guy. I’d have been happy to do the same for an official effort. But “official” wasn’t interested. “Official” just wanted us to go away. (1) The owner of the car still owns the white car and has exclusive use of the parking space … note the pickup in the background is not there. (2) The position of the church is a consequence of the changed position of the photographer. (3) That pedestrian would have long been picked up on vagrancy charges or run over if he/she was still attempting to cross the road. As usual, your contributors are long on empty rhetoric but very short of legitimate argument. And to others (too many to mention), I would say this, thanks to my recent completion of an MA in Environmental Politics, I am very much aware of all of your unfalsifiable and/or self-referential arguments – and the origins of this website. Therefore, I am very confident that within say 10 years you will all be consigned to the dustbin of history (if not the ICHR for crimes against humanity). So, as I have said before, enjoy your fun while it lasts. We are onto you; and your days are numbered! For those analysing the two pictures Anthony shows, and the angle of the sun shown, I have discovered that WolframAlpha will produce sun angles for locations and dates. I entered : “angle of sun at Ardmore Oklahoma jan 2, 2009” , without the quotes, and all sorts of information is displayed that you can use for your own analysis. I am too lazy not higly motivated at the moment to do any further analysis. It’s not the fact that the stations were poorly sited that is so worrying. It’s that they deny they were poorly sited in public and then admit that they were behind closed doors. Dishonesty like this is an iceberg. What we see will always be a very small fraction of what is really going on. For every misdeed we spot, there will be an order of magnitude more misdeed which we cannot see. That is why no one will ever trust anything from these scoundrels again. If they had come out, thanked those who had done the reports. Came back with a response saying: “we intend to change these stations and this is how we intend ensure the temperature record is not contaminated either by their inclusion or removal”, if they were open honest and willing to listen, then they would be trusted. They just don’t behave like real scientists … look at CERN. The results challenge a fundamental law of science, and after thoroughly checking they make public their work because they had ruled out anything obvious and needed their work scrutinised. There’s no comparison. CERN = real science. This bunch of climate loons are charlatans who don’t deserve to be running a plumbing business … because plumbers are far better than them! Congratulation Anthony – you’ve been one of the lone voice pushing this story for YEARS! This must give you a great feeling knowing you were accurate in your reporting – and through you – we were informed of the problems associated as written. Because of that this is not news to any of your readers either – this is merely an admittance informed reader waited a long time to read for themselves. In my mind the problems then are very real – much of the global warming or climate change or whatever they’re calling themselves these day are as a result of badly flawed NOAA reports with were heavily used by East Anglia cutting into the black heart of the climate debate itself. However the chances of anything actually changing are nil and never even know the data itself is badly flawed. Of the ~7500 NOAA NWS weather stations only 2680 generate what you might call reliable weather data 24/7 where we know where they are. To produce this http://91.192.194.209/averagehourlytemp3.png I was weeding out duff weather stations for about 4 months. It’s rough at the coal face of temperature measurement. the admits being a student of the Environmental Political system and quotes Monbiot. He must have a heart or he couldn’t be posting and he shows courage by trolling here, so perhaps he could follow the yellow brick road of truth and the Wizard at the end will give him what he lacks? I’m sick and tired of hearing about CO2 being an evil gas. It is not discussed in most chemistry or plant propagation literature, but one of the major nutrients that is missing from good crop growth is CARBON. Plants DO NOT uptake Carbon via their roots; Carbon comes from leaves absorbing CO2, releasing the Oxygen and using the Carbon! Greenhouses have CO2 generators that attempt to double the CO2 levels to 800 ppm or more. Plants grow astonishingly well in an environment rich the following: CO2, fertilizer, warmth, humid air. Since I learned these items, my Orchids have doubled their growth rates, exceeding all but the best growers. CO2 increases in the environment have occurred after the Sun warmed the regions: not before. By burning fossil fuels and increasing the CO2 levels; we are doing the best climate interactions that man can do!!! Let us hope that the increased CO2 levels will counter-balance the effects of a quiet Sun, and “trap more of that missing heat”! Yet here you are, using a computer, and running a blog, which relies on a HUGE infrastructure, mainly powered by CO2 emitting sources, and manufactured from evil industry. Are you going to be the first against the wall when the revolution comes? Or will you voluntarily give up ALL modern conveniences developed since, say 1700, and return to the short and brutal life of your ancestors? If you really think there is a catastrophe going on, then you are a huge part of it. Practice what you preach, then maybe we’ll listen to you. Jeff (@8:33 am), If that is the best you can do in the way of a well-reasoned argument to counter my pointing out to you that you are all being taken for a ride by big vested interests (letting you do all their dirty climate chage denial work for them), I feel doubly sorry for you. What makes you think you’re not being taken for a ride? FWIW, you haven’t made a well-reasoned argument, so a well-reasoned response isn’t really warranted. All you’ve done is call us names and threaten us. I asked you that if you really think there is a catastrophe going on, doesn’t it behoove you to completely give up the “carbon” lifestyle? Or do you think changing your light bulbs and riding a bike will make it all better? Alarmists such as yourself are demanding a return to pre-industrial levels of CO2. The only way to do that is to get rid of ALL industry. So I’m waiting for alarmists to take that step and give up all their modern conveniences. I don’t deny “climate change”, but it sounds like you think it should be completely static. Philip Bradley (@4:15 pm yesterday) “Martin_Lack, I followed the link you provided to your blog. In order to save others time, I’d summarize it as conspiracist nonsense” (emphasis mine). You’re accusing me of having been duped by a conspiracy? That is the funniest thing I think I have ever heard in my enitre life (and no I am not a humourless hermit – indeed I am reading this blog aren’t I…?). In this context, you really ought to read my latest post, a comment by Robert Cook, and in particular my response to it. You might actually learn something! Martin Lack is a blinkered fool spouting CAGW nonsense. He’s trolling here to get people to click on his pathetic blog in order to raise his low traffic numbers. Don’t take the bait. Lack lacks any understanding of the null hypothesis, which falsifies the alternate CAGW hypothesis. Lack should get up to speed before emitting his nonsense here at the internet’s Best Science site. The current global climate, temperature, trends, and rates of change are not only well within the parameters of the Holocene, they are especially benign. We are truly living in a “Goldilocks” climate. Mendacious propagandists like Lack try to tell people that every weather occurrence, and every unusual event of any kind is proof of CAGW. But those are simply routine fluctuations that happen all the time. Lack needs to study up on the null hypothesis before spouting his alarmist nonsense here. Smokey, Ignoring for a moment your pathetic, peurile, attempts to make fun of my name, you seem to be overlooking the fact that I am not some spotty-faced teenage philosopher, I have a degree in Geology (so I can put what is now happening into its proper context myself without lectures from you thanks), I have an MSc in Hydrogeology (so I know all about the carbon cycle and the water cycle) and now I have an MA in Environmental Politics (so I understand how so-called “sceptics” have been duped into acting as a “front” for the real criminals in all of this – those that do not want you to change your behaviour in any way). I am not sure why you keep mentioning null hypothesis but, when conservative think tanks (in the UK at least) start admitting that AGW is real* (even though they still dispute what we should do about it) – I think you guys should accept that the game is up (you lost). *. e.g. the Adam Smith Institute, Policy Exchange, and the Taxpayer’s Alliance. and those that don’t necessarily understand the ‘science’ but can clearly read or observe that climate variation is natural and again, over-hyped in the context of AGW thereby making them skeptical. Claiming skeptics are conspiracy theorists to boot is rather puerile, IMHO – and clearly demonstrates a likely limited dialogue with scientific type skeptics! Any elaborate AGW hoax/scam/call it what you will – may well be shown one day – in the meantime, you and your fellow AGW-proponent types need to prove the ‘concensus’ science is correct rather than diss skeptics in such a manner. Jeff, the conspiracy to deny AGW is a well-documented fact. Those that are “sceptical” can’t even agree what their conspiracy theory is. How about the conspiracy to redefine peer-review, or to hide the decline? Do you think all AGW proponents agree on all aspects of AGW? Of course you still failed to respond to my main point I made originally, that the only way to reduce CO2 to pre-industrial levels is to get rid of ALL industry, period. Since you’re not inclined to give up your modern conveniences, one can only conclude that you don’t believe what you’re peddling. Maybe you’ve got some fancy degrees, but I can tell you I’ve met some very smart people who had zero common sense. Again, do you think climate should be static? Do you think a couple degrees of warming is worse than a couple degrees of cooling? To get the Earths energy, we have to take humidity into account too. Just like to point out that the eminent Mr. Lack, who has suddenly appeared here like a rabid dog is the very same gentleman who felt motivated to write a damning review of Delingpole’s new book (Watermelons) on Amazon. The review goes into great detail about why the book is wrong in so many ways. Unfortunately, Lack admits that he hasn’t actually read the book. I think this says more about Lack than he would care to admit. Steve, the criterion of quality in a surface station air temperature record is accuracy, not inter-station correlation. What were they using as their calibration instrument, to supply an accurate temperature standard at the test stations? Thanks. Because it deconstructs the CO2=CAGW conjecture, which has always been nonsense. Trenberth wants to “redefine” the null hypothesis. Why? Because it makes his CAGW nonsense look like the fakery that it is, and Trenberth knows it. Martin, the causal physical meaning of the recent warming trend can only be supplied by a falsifiable physical theory. That’s how science works. Presently, the best physical theory of climate is represented by GCMs — the climate models. Over and over, they have been shown unable to hindcast past climate. For a very accessible demonstration of this fact, see Demetris Koutsoyiannis’ recent paper. Jeffrey Kiehl’s paper (2007) “Twentieth century climate model response and climate sensitivity” GRL 34, L22710, pointed out that different climate models varied by a factor of two in climate sensitivity, but made up for it by using aerosol forcing as a compensating fudge factor. That means minimally there’s a factor of 2×2=four uncertainty in climate model parameters that must be propagated forward through the outputs of every time step of a future global climate projection — imposing time-wise increasing uncertainties in air temperature, precipitation, global cloudiness and so on. Very quickly, the projections of climate models become devoid of predictive meaning even if the results are bounded and seem reasonable. These uncertainties are virtually never included in papers discussing future climate, nor in any of the publicity releases of the IPCC. The uncertainties of GCMs have been generally neglected in the discussions of climate, and are so large the GCMs are effectively unfalsifiable. The uncertainty and non-falsifiability of GCMs means that no causal physical meaning can be assigned to 20th century climate warming. All the AGW finger-pointing at melting ice sheets and so forth is so much unscientific correlation = causation argumentation. Climate alarmism has no scientific basis on which to stand. Your MA in Environmental Politics has clearly left you unprepared to evaluate whether you have an objective basis for your position. You haven’t one. Oh heavens, we have a troll who is willing to admit to a degree in “Environmental Politics”. If I had a skeleton like that in my closet I might be inclined to keep my mouth shut. I wonder what sort of institution issues such…need to moderate my language here…rancid sheepskins. @steven mosher So a CRN5 rating is basically any site that’s worse than CRN4? That opens up the scale of bad for CRN6 or higher. What about the ones in the middle of parking lots or on top of buildings with black tar roofs? Kudos to Watts & Company for their tireless efforts to clean up the “system”. I have not got the time to sit on this site all day and every day and respond to every single ad hominem attack by people who cannot even be bothered to check my blog to see if their personal remarks have any legitimacy. I accept that it was unwise of me to post remarks like “your days are numbered” and “the game is up (you lost)” but, I am not attacking any of you personally – I am just trying to point out to you that you are not being objective or rational in dismissing the findings of climate science as a hoax, scam, or whatever you want to call it. The world, most politicians, and even some conservative think tanks are moving on; they are trying to tackle the problem. You are merely delaying the effectiveness of that action by slowing it down and – in so doing – you are in effect self-harming because, the longer we delay the harder it gets to take effective action. This is not scientific scare-mongering; it is an empirically-based, laboratory-tested and, now, an observable fact. Some of you demand evidence but do not accept it when it is presented to you: disappearing sea ice, melting permafrost, retreating glaciers, desertification, crop failures, food shortages, water scarcity. These are all consequences of ongoing AGW not consequences of our attempts to prevent it. If your response to this is to say that I am being duped by a conspiracy – based on your faulty interpretation of some CRU/UEA emails (or whatever) – then you may be so far down the conspiracy theory rabbit- hole that I cannot help you. If someone would like to fix the html code in that previous comment, I would be very grateful (although hopefully it does not detract too much from the message)! You’re arguing correlation = causation, Martin. That’s hardly scientific. As I noted above, GCMs are entirely unreliable and it’s therefore entirely unknown whether the added CO2 has caused any perceptible change in air temperature — or ocean temperature for that matter. You’ve been gulled by the partisan IPCC commissariat. Pat Frank – This appears to be what some of you like to call your null hypothesis, which I understand to mean that you will not accept AGW is real until all other explanations can be proven 100% false. That is ridiculous and will never happen. Solar flares and or cosmic rays (or whatever alternate explanation you are going to roll out this week) cannot explain the steady upward march of CO2 levels in the atmosphere. Playing around with the vertical exaggeration of graphs with two y-axes to make it look like there is no comparative trend in temperatures is pure fakery. The most likely reason why temperatures (in lower latitudes) have not continued rising over much of the last decade is very probably due to global dimming caused by industrialisation in less-developed countries. None of this invalidates the basic science of Tyndall, Arrhenius, etc, the mutually-reinforcing nature of the CO2-temperature relationship through the positive feedback mechanisms whose effects we can now see. You say “The uncertainty and non-falsifiability of GCMs means that no causal physical meaning can be assigned to 20th century climate warming“. Why is it then that 97% of climate scientists think they do know why our climate is changing (I’m glad to see that you accept it is). If you go looking for a WMO/UN/IPCC conspiracy like Andrew Montford did, you will see what you want to see and find what you want to find. But, as I keep saying, your conspiracy is an illusion; whereas the historical evidence for a conspiracy to downplay, deny and dismiss all environmental problems, ongoing since Rachel Carson’s Silent Spring, is available in any library. Martin Lack still has no understanding of the null hypothesis, as his comment makes clear. He’s floundering around trying to figure it out. The null hypothesis is the statistical hypothesis that states that there are no differences between observed and expected data. Typically, an alternate hypothesis [such as CO2=CAGW] is tested against the null hypothesis. In this particular case, there are no temperatures, rates of change, or trends that are outside the previous parameters of the Holocene. Therefore, the alternate hypothesis fails. It’s as simple as that. Nothing unusual is happening. Kevin Trenberth has demanded that the null hypothesis must be changed, because he knows that it falsifies his “hidden heat in the pipeline” nonsense. If the null hypothesis didn’t matter so much, Trenberth would just ignore it. But Trenberth says, “The null hypothesis should now be reversed, thereby placing the burden of proof on showing that there is no human influence.” So skeptics would then have to prove a negative, eh? The fact that Trenberth wants it changed tells us all we need to know about the failure of the catastrophic AGW scare. Next, the “97%” figure that Lack cites has been so thoroughly debunked here and elsewhere that repeatedly deconstructing it becomes tedious. Lack can just use the search function to find out how preposterous and plain silly that number is, and the contortions it took to come up with such a nonsense number. Finally, it seems obvious from Lack’s comments that he has never read A.W. Montford’s book, which is heavily annotated with an index of 270 separate sources. The book was completed just as the Climategate email leak appeared, and those emails confirm everything Montford wrote. Lack has a cognitive dissonance-based belief system. In his case it appears incurable, but the record needs to be set straight for others when someone posts the easily refuted nonsense that Lack has been posting here. Checked your blog. It’s complete drivel. OK, in response to my request for a halt to the ad hominem attacks, what do I get? More of the same. No surprise there then. I have apologised for my earlier inflammatory remarks, so I am not going to do so again. To Smokey – I have read Montford’s book and it is supposition based on supposition. Unfortunately, it is all based on a false assumption that the WMO and UN set out to fool the world into funding climate science research through the IPCC. However, if you feel that Climategate is proof of this supposed conspiracy, then, clearly, I cannot help you. Nothing I say will convince you otherwise; but I cannot apologise for saying you are wrong (i.e. that is my opinion – not an insult). To DirkH – If my blog seems to be “complete drivel to you that is fair enough (i.e. that is your opinion). What I was asking people to stop doing was making assumptions about what I know, what I believe, and what my motives are (so I suppose that I should be grateful that you did not do so). To all – I say this, your conspiracy theory requires the complicity of so many people, it makes the views of the 9/11 Truth Movement seem highly plausible by comparison (IMHO). Therefore, I am not surprised by your hostility because I am challenging your firmly cherished ideas and beliefs. However, that alone does not make me wrong, however much you might wish it, or however many times you say it. At very least, anthropogenic carbon dioxide emissions are the best explanation we have for the temperature increases we have seen over the last 100 years and for the observable climate disruption we are seeing now. Obviously, I feel it is far more certain than that – or I would not be getting so angry with your failure to accept this as legitimate cause for concern. They may be consequences of a changing climate or poor land management, but they are not necessarily consequences of ongoing AGW, especially AGW caused by anthropogenic CO2 emissions which is the main point of discussion. Have we been warming since the end of the LIA” – mostly yes, lately not so much, but it is likely that we will begin warming again (unless the folks suggesting we are about to begin a cooling phase are right). Has the atmospheric CO2 level been rising also since shortly after the end of the LIA? – again, yes. However, while the rate of the atmospheric CO2 rise has been fairly consistent, the cooling and warming has not, although it has been somewhat cyclic as it moves in the warming direction. Ask yourself – how much CO2 is put into the atmosphere each year? How much is put there by anthropogenic CO2 emissions? What percentage then is the anthropogenic contribution? Why then, of the about 2 ppm of CO2 being added to the atmosphere each year, isn’t the anthropogenic contribution that same percentage? Wouldn’t that be just as logical as saying the entire 2 ppm is anthropogenic? -Etc. causing etc. by etc. reported by etc., etc. are not proof of CAGW by CO2. Martin, you’ve completely misunderstood the point. The point is this: climate models are demonstrated to be unreliable. The idea of AGW depends entirely on the reliability of climate models. Since climate models are unreliable, the AGW conclusion is unsupportable. Figure it out — you claim to be trained in science. If the theory is unreliable and cannot make physically valid predictions, then its outputs are not to be taken seriously. Climate models are unreliable. Their outputs are not to be taken seriously. AGW is their chief output. AGW is not to be taken seriously. There is no scientific basis — at all — to think that the present warmer climate is in any way due to humans. That breaks your political rice-bowl — I understand that. You’ll have to find a new career and a new passion. The earlier you start on that, the better off you’ll be. Here, Martin, take a read of my Skeptic article. It’s backed up by the calculations (892 kB pdf), that support its points throughout. See if your AGW belief system survives the experience. I’ve read into the IPCC 4AR — there are references to it and extracts from it in the Skeptic article. The uncertainties expressed deep in the supplementary reports of the back chapters do not support the IPCC statements about the certainty of AGW made in the Summary for Policymakers. That internal self-contradiction is a sign that the leadership has conspired against the membership. It doesn’t matter that “97%” of climate scientists believe. It only matters what the science itself says. That’s where I’ve focused my attention. So should you do. Pat – I note your failure to address my challenges regarding the scale of your required conspiracy theory. As part of this, you are seeing what you want to see in AR4: The internal contradictions are a sign of nothing. In science there will always be uncertainty. The summary for policy makers is just that – a summary – of the key points, the most likely scenarios, the best course of action, etc.. This “contradiction” is only sinister because you have decided that it is. I would dearly love it for you to be right and everyone else wrong but, honestly, how likely is that? Why have you not been able to get your ideas published in a peer-reviewed scientific journal? Why are they just sloshing-around on the Internet? It is just not good enough to say you don’t believe in the peer-review process (you just appear more of a conspiracist than ever). This is the way scientific knowledge advances. The only thing advanced by the Internet (much of the time) is conspiracy theory. You need to accept this; and act accordingly. Martin, in the first place, the uncertainties concern the ability of GCMs to resolve any climate process remotely near the energetics of a few W/m^2. They cannot do so. Their errors are easily 10x larger. This is the message deep inside the 4AR. Therefore every claim about the effect of increased CO2 on climate is entirely spurious. Nevertheless, the SPM insists on the certainty of a profound CO2 influence on climate temperatures. This claim is insupportable by the IPCC’s own document. The IPCC leadership must know this. And yet this knowledge hasn’t stopped them from issuing, and re-issuing, objectively false statements. What would you call that? Next, my Skeptic article was peer-reviewed — first by the scientists whose names appear in the acknowledgements, next, prior to publication by two climate scientists recruited by Michael Shermer — I had to fully respond to their criticisms — and finally on the web where the article was successfully defended against analytical criticism, including on RealClimate. After all is said and done, that article was reviewed as thoroughly as virtually any published paper, and it is unscathed. Likelihood isn’t the point, Martin. The point is science. In science, one person could be right against the weight of the entire establishment. I, like almost everyone else here, have come to my conclusion after studying the science. Science doesn’t support any of the alarm about CO2. You need to pay attention to Richard Lindzen; see the video here, for example, or read his article here. He is dead on right. If that’s true, then why is there so much alarmist hoopla by so many otherwise qualified people? It’s hard to know. I suggest, though, that Hannah Arendt and her thesis on the power populist culture can exert over the normative views of a society might have some insights about that. The German Academy that officially and publicly rejected Relativistic Mechanics included some brilliant physicists. Likewise, AGW has been successfully politicized by the AGW crowd and far too many people are letting their political passions decide their views on a scientific issue. To all – I say this, your conspiracy theory requires the complicity of so many people…. Martin, you cannot refute the fact that ipcc is not doing real scientific method and principle science by claiming that this fact is impossible! Your own method of reasoning is irrelevant here, so what about the rest of it? For example, doesn’t it bother you that while 97% = 75/77 actual numbers of “Climate Scientists” apparently boast that they can’t explain the past record without invoking atmospheric CO2 concentrations as the primary driver of atmospheric temperatures and using appropriate forcing adjustments, they can’t get even one prediction correct as compared to empirical reality with the use of atmospheric CO2 concentrations and the same general “forcings”? Here they’ve managed to effectively falsify their own mechanism, but it doesn’t bother them! So the real question you should be asking yourself, Martin, is why doesn’t it bother you? Perhaps it’s something about “challenging your firmly cherished ideas and beliefs.”? the longer we delay the harder it gets to take effective action. The solar panel and battery car people are the first to proclaim that their costs will decline substantially in the next 10 years. Why buy solar panels and battery powered cars now when the supporters claim they will be ‘almost free’ in a few years time? If I believe the Solar Power and Battery car enthusiasts then the ‘costs to act’ get cheaper, not more expensive. Although I’m ultra-skeptical about AGW and de-carbon-dioxidizing, I rather like electric cars — if done right. To date, only TeslaMotors is doing it right. Their cars run from 150-300 miles on a charge, and are an absolute blast to drive. The recently showcased factory for their new luxurious and very fast Model S, half the price of the showcase sport car “Roadster” they put on the road a couple of years ago, is about ready to start cranking (and they are putting the power train in the new Toyota RAV4-EV model). Tesla is planning, it seems, to put fast charge stations every 100 miles along every major route in the US, for free. Anthony Watts etal, should be praised for bringing this corrupted temperature data base to the public’s attention. The Law of CICO always applies. NOAA and the U.S. climate data collections system is supposed to be the world’s best, and if this is corrupted, how can we expect data from elsewhere to be any better? Thankfully NOAA and DOC have been forced by Congress and GAO to address this problem. The bigger problems are: 1—will the corrupted data still be used for future scientific analysis, modeling, and predictions without sifting out all the dubious stations; 2—will all the past analysis, modeling, and predictions be corrected and updated with valid data; 3—obviously past attempts at correction factors have miserably failed or tried to cover-up the corrupted data.